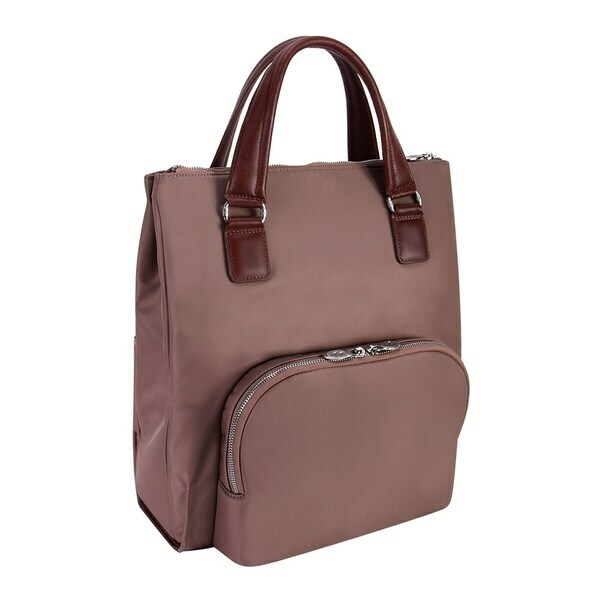 4-in-1 convertible nylon backpack tote with leather handle and accents. Converts into a vertical briefcase, backpack, crossbody and shoulder bag. Fully-lined interior with leather accents. Exterior zippered compartment with inside pocket. Main compartment features a padded tablet pocket and a secure full-length zipper pocket. Silver accent hardware and metal zippers. Nylon smart strap for piggy-backing. Removable and adjustable nylon straps that convert the tote into a backpack. Dimensions 13.5 In. X 4.25 In. X 15.3 In.